This dynamic group is designed for people concerned and involved in promoting animal right legislation. We invite you to join us and to create a new chapter in animal rights. 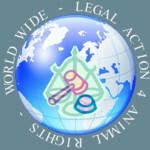 Legal Action 4 Animal Rights (LAAR) is a dynamic global group which would be most appreciative of both your membership and your ideas and input. Legislation protecting animals from suffering cannot be effectively observed without raising the awareness of issues and without the direct involvement of the international animal welfare community, and so we openly invite you to join us and to help create a new forward looking movement for animal rights. 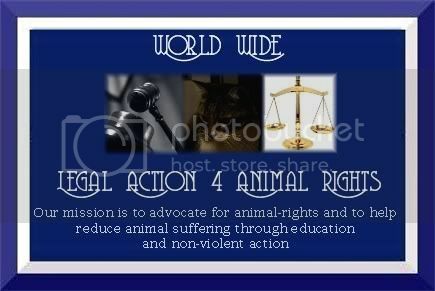 World Wide - (Legal) Action 4 Animal Rights is a dynamic global group which would be most appreciative of both your membership and your ideas and input. The group is an online animal rights resource with the mission to advocate for animal-rights and to help reduce animal suffering through education and non-violent action. Animals are counting on compassionate people like you to give them a voice and be their heroes by learning about the issues they face and taking action. Together, we can make a difference. Action Alerts and petitions offer education and background information.Writing letters is a very effective way of spreading the message about animal rights and protection. By writing to newspapers, media, to politicians and to businesses, we can educate others and even introduce new policies. When you send letters and ask yourself "will this do any good? ", let this be a reminder that, together, our voices can be quite loud, and people do listen.